An article published in the current issue of Tobacco Control, released today, examines the reasons for Philip Morris' support of FDA regulation of tobacco products, using internal industry documents. (See: McDaniel PA, Malone RE. Understanding Philip Morris' pursuit of US government regulation of tobacco. Tobacco Control 2005; 14:193-200). "Philip Morris’s support for government regulation of tobacco is part of a broader effort to address its negative public image, which has a damaging impact on the company’s stock price, political influence, and employee morale." "Through regulation, the company seeks to enhance its legitimacy, redefine itself as socially responsible, and alter the litigation environment." "Whereas health advocates frame tobacco use as a public health policy issue, Philip Morris’s regulatory efforts focus on framing tobacco use as an individual choice by informed adults to use a risky product. This framing allows Philip Morris to portray itself as a reasonable and responsible manufacturer and marketer of risky products." The authors conclude that: "Philip Morris’s ability to improve its image through support of FDA regulation may undermine tobacco control efforts aimed at delegitimising the tobacco industry. It may also create the impression that Philip Morris’s products are being made safer and ultimately protect the company from litigation." helping to protect the company from significant damages in ongoing and future litigation. First, it would create an FDA "stamp of approval" for tobacco products, which would likely decrease the public's perception of the inherent harm of tobacco products. By officially sanctioning the products, the government would be giving the public a false perception of a level of safety. Second, it would create a perception that the tobacco problem has been taken care of, and no further interventions are necessary. It would become almost impossible to convince state legislators, for example, to allocate substantial funds for tobacco control once FDA is given authority to regulate the product. Third, it would essentially end tobacco litigation, by allowing the cigarette companies to argue (correctly) that they have already submitted to FDA regulation and so no further punitive or injunctive relief is required. If this legislation is enacted prior to the resolution of the DOJ tobacco lawsuit, it will completely decimate that lawsuit. Fourth, it would produce an enormous amount of goodwill for the tobacco companies by enabling them to tell the public (accurately) that they now fully comply with a comprehensive system of federal regulation of their products. Importantly, the article reveals that Philip Morris sought to include in the legislation a distinction between "reduced risk" and "reduced exposure" products. As the authors conclude: "This would allow PM (and other tobacco companies) to market reduced exposure cigarettes based on an initial determination that they exposed smokers to fewer toxins." But this marketing would essentially be done without substantiation of any health benefits. Consumers would likely interpret the reduced exposure claim to imply a health benefit. Thus, the legislation would institutionalize the very problem of misleading health claims that groups like the Campaign for Tobacco-Free Kids have argued are the very reason for the need for this legislation in the first place. In summary, the rest of the story reveals that the proposed FDA legislation would be a huge victory for Philip Morris and an equally huge loss for the public's health: the company's public image, litigation risks, and ultimately, its bottom line would improve at the expense of a decreased appreciation of the health risks of smoking, a false sense of public security over the health risks of tobacco products, and an elmination of the possibility of justice for victims of tobacco industry products. The American Legacy Foundation's corporate partner - Time Warner - which the Foundation describes as being a "leader in this important movement" has unveiled a new series of smokeless tobacco ads in its prime publication: TIME Magazine, which are apparently designed to try to induce smokers to add smokeless tobacco to their list of carcinogenic products which they use. One ad (see below), which appeared in the May 16 issue of TIME, shows two young men playing pool in a smoke-free sports bar and reads: "Enjoy tobacco in a smoke-free sports bar? Believe it." A second ad in the series, which appears in this week's TIME, shows a man sitting as his office desk in a presumably smoke-free workplace and reads: "Enjoy tobacco in your office without stepping outside? Consider it done." There is no need for alarm, however. Legacy's lead corporate partner is still promoting the conventional way to get cancer - smoking cigarettes - in ever increasing volume and appeal. 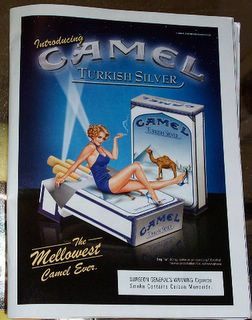 The same May 16 issue of TIME contains a beautiful ad for Camel Turkish Silver cigarettes (see below). This new smokeless tobacco ad campaign is particularly disturbing because it promises to undermine one of the main public health benefits of smoke-free workplaces and public places: decreased tobacco consumption. The campaign aims to take advantage of the spread of smoke-free policies to promote the use of smokeless tobacco among smokers who would otherwise either not smoke at all or have to take the trouble to go outside to light up. What is even more disturbing, however, is the fact that this new campaign, along with the increasingly intensive cigarette marketing campaigns, are being delivered to the public by a company that is the lead corporate partner of the American Legacy Foundation, a presumably anti-smoking organization that has awarded the magazine subsidiary of the company for its "progress in tobacco-free publications." Unfortunately, when you forge a corporate partnership with an organization, then you share somewhat in each other's failures as well as accomplishments. Time Warner is certainly gaining in terms of public image from its recognition as a leader in the tobacco control movement. It inherits, by virtue of the partnership, much of the goodwill that comes with being associated with an anti-smoking organization. In the same way, by virtue of its partnership with the producers of the above magazines, Legacy has become associated with the widespread promotion of smoking and smokeless tobacco use, which is clearly contrary to its overall mission. While I do not expect the Legacy Foundation to retract its award from Time Inc., I think if it wishes to have any credibility as an anti-smoking organization, it needs to immediately discontinue its partnership with Time Warner. Otherwise, we can blame Legacy, in part, for the devastating effects that Time Inc.'s published advertisements are having and will continue to have on promoting the use of the most toxic and deadly consumer product. Does Legacy really want to continue to be associated with that body count, just in apparent attempt to try to garner more money and support for its programs? "provide FDA authority over tobacco products just like the authority it has over drugs, medical devices, and other products we consume." The FDA legislation allows the Agency to require the reduction or elimination of specific tobacco constituents, but not in a way that fundamentally changes the design of the product (for that would conflict with the bill's provision that it cannot ban any specific class of cigarette). Because there are over 4,000 toxins and more than 40 carcinogens, there is absolutely no evidence and certainly no substantiation for a claim that elimination of a few of these components would have any effect in terms of making tobacco products less toxic. Thus, in claiming that the removal of some of the components in tobacco smoke will make cigarettes less toxic, the Campaign for Tobacco-Free Kids is essentially making an unsubstantiated health claim. Yet in the same action alert, the Campaign asserts that we must "stop tobacco companies from misleading the public about the health consequences of using their products." Perhaps the Campaign should first set an example by discontinuing its propaganda which is misleading public health advocates, policy makers, and the public about the potential health consequences of using products with somewhat fewer than 4,000 toxins and somewhat fewer than 40 carcinogens. At least until there is scientific substantiation that that performance standards as established by FDA would indeed make cigarettes less toxic and reduce disease rates. A more fundamental and more irresponsible misrepresentation of the legislation is the Campaign's claim that it would "provide FDA authority over tobacco products just like the authority it has over drugs, medical devices, and other products we consume." The truth is that the legislation gives FDA authority over tobacco products which is nothing like its authority over drugs, medical devices, and other products we consume. By misleading its own constituents about the information that is essential for a decision about the merits of this important policy proposal, the Campaign for Tobacco-Free Kids is shirking its ethical responsibilities under the Public Health Code of Ethics. I think it is time for new leadership in the tobacco control movement. Can we begin by having some integrity and a commitment to revealing the truth? A recent University of Minnesota report on potential reduced exposure products (PREPS) has generated considerable discussion among tobacco control researchers and practioners about the apprpriate role of such products in an overall tobacco control strategy. The discussion over reduced risk products is also a central part of the debate over the Campaign for Tobacco-Free Kids and Philip Morris-supported FDA legislation that Congress is currently considering. But there is a fundamental paradox in the entire idea of a reduced risk product approach that I have not seen mentioned. The only way to know for sure whether a new type of cigarette reduces health risks is to study the long-term effects of the use of that product among a relatively large number of smokers and to compare the risks with those of the use of conventional cigarettes. But how would such a study be done? Unlike testing the effects of drugs, which is done through a randomized trial, one could not ethically assign human subjects to smoke a conventional cigarette. Neither could one assign subjects to smoke a potentially reduced risk product. And even if one recruited a population of smokers who were already using a particular product, one could not instruct them to continue using that product. One would, in fact, be ethically obligated to deliver intense smoking cessation interventions to try to get all subjects to quit. Standard care, in this case, must be defined as trying to get the subject to quit smoking. Such studies could simply not be done, under ethical grounds, by scientific researchers at any kind of academic or government institution. So what this means is that the only real way to conduct these studies is for the cigarette companies to do the studies themselves. And they can only do them by observing large numbers of smokers over a long period of time. By definition, a potentially reduced risk product would have to be marketed to people before knowing the risks of that product. But this brings up an interesting question? Should the companies inform the consumer that the product being tested is a potential reduced risk product? If consumers are so informed, then this may be viewed as the cigarette companies making unsubstantiated health claims. If consumers are not informed, then they are essentially being used as guinea pigs with no idea that they are actually serving as subjects in research. While this violates basic standards of human subjects research in academic and government settings, the tobacco companies are not subject to these standards, and so perhaps such research would be acceptable. But it would certainly represent the withholding of critical information from consumers. Perhaps a more pressing problem would be the difficulty of marketing a new product without being able to make any health claims. Why would smokers switch from the well-established, well-marketed cigarette brands to a new product that is not being promoted based on a claim of potential health benefit. How many entirely new cigarette brands have been successfully marketed in the past two decades based on anything other than a potential health claim or simply based on low price? And it is unlikely that the costs of the required research project would enable a cigarette company to test market a low-priced product. This is truly a dilemma. In order to be able to substantiate potential reduced risk health claims, cigarette companies must do long-term research to study the effects of the product in large human populations. But in order to feasibly conduct that research, companies would need to be able to market the product based on a claim of potential health benefit, that is, by definition, unsubstantiated. I think there are two reasonable responses to this dilemma, and one unreasonable one. The first reasonable response would be to simply abandon any efforts to promote the development of reduced risk cigarettes. We would simply concentrate our efforts on reducing the demand for the existing products. If cigarette companies, on their own, market potentially reduced risk products, we would monitor the marketing claims to make sure that no unsubstantiated health claims were being made. Such an approach would likely deter the development of such products, since as I argued above, companies could not likely successfully market a new product without being able to make some sort of health claim. There would be likely be little change in the existing market. A second reasonable response might be to encourage companies to develop reduced risk products, and to provide an incentive that would make this feasible by allowing companies to inform their customers that the product is a potentially reduced risk product. This would likely encourage the development and testing of reduced risk products and the market competition would likely result in substantial changes in the existing market (although it is unclear whether the changes would result in safer cigarettes or not). The one approach that seems completely unreasonable would be to tightly regulate the marketing of potential reduced risk products such that companies cannot make any health claims unless they are substantiated, but to allow reduced exposure claims to be made without any substantiation. Such an approach would completely stifle any development of reduced risk products, but would allow the marketing of products that merely reduce exposure to one or more substances under unsubstantiated health claims (which will likely mislead consumers into thinking the product is safer). This would both eliminate the possibility of any meaningful changes in the safety of the product and undermine the basic goal of preventing companies from making misleading health claims, which would likely encourage smoking. This last approach is in fact the approach that is being promoted by Philip Morris and by the Campaign for Tobacco-Free Kids, and is embodied in the FDA tobacco legislation that is currently being considered by Congress. If anything is clear from this paradox, it should be that the focus of tobacco control efforts must remain on the movement to reduce the demand for tobacco products. If reduced risk product advantages come, they will only come from a competitive marketplace (unlike that proposed in the FDA legislation), and then, they will only come at the expense of allowing tobacco companies to market cigarettes based on their potential health benefits. Yesterday's post (A Sad Day for Clean Indoor Air in Indiana) generated much discussion among tobacco control advocates regarding what constitutes a "good" versus a "bad" secondhand smoke regulation and what effects enactment of various restaurant smoking laws might have on the overall effort to protect workers from secondhand smoke exposure. Today, I want to suggest a simple criterion that advocates could use in evaluating whether to support a proposed law. Contrary to the way some readers portrayed my argument, I am not arguing that anything short of a "perfect" law (i.e., one that provides protection for all workers in all establishments) should not be supported, although I think that if secondhand smoke is the hazard that advocates are arguing it is, then all workers deserve equal protection from this hazard and the goal is to provide a level playing field for all workers and all establishments. However, with an eye towards ultimately providing protection to all, there is room in the policy making approach for an incremental strategy (e.g., one that starts with restaurant workers and then later extends to bar workers). Such an approach can, I think, be justified on the grounds that if the public is not ready for eliminating smoking in a particular type of establishment, then a law may not be enforceable and it is not in the interests of public health to deny protection to workers in a particular type of establishment while waiting for social norms to change to support a broader policy. However, I think that in order to justify a law that only provides partial protection, there must be a specific, systematic, and reasonable consideration that dictates the need for such an incomplete approach and for the establishment of an unlevel playing field. Social considerations may justify such an approach. But the key factor is that exemptions from the law must not be capricious. Now the question becomes: how can one judge whether decisions to exempt particular establishments are capricious, or whether they are reasonable based on public health considerations? I think the answer is whether the law guarantees protection for a broad class of hospitality workers - such as all restaurant workers. If the law is only guaranteeing protection for customers, then a reasonable interpretation of the law is that it is intended to protect the customer and not the worker. There are two major problems with laws that are intended to protect customers, rather than workers. First, customers have a choice about whether to eat out at a smoke-free restaurant or not. It is difficult for me to justify the degree of government intervention that is required to set an unlevel playing field for business establishments by setting up inconsistent rules for different types of establishments if the primary reason for the rules is simply to give customers more choices of where they can eat out. Second, by framing the issue as one of customer protection rather than occupational health, advocates who support such legislation are actually, I think, harming the overall goal and long-term success of the clean indoor air movement. After all, it is really the fact that we have been so successful in framing this as an issue of worker health and protection that explains the widespread success, especially recently, in the enactment of smoke-free bar and restaurant laws that do provide equal protection for all workers. A California publication put out by the Department of Health Services and BREATH explains how the framing of this issue as one of occupational health, rather than customer health, is one of the key factors in the successful promotion of smoke-free laws. So, for example, I think that basing exemptions on something like the clientele of a particular restaurant (i.e., whether it allows youths or not) is capricious and there is no justification for such an approach on public health grounds. Such a policy does not guarantee protection for any workers, much less for a broad class of workers. What such a policy is actually doing is allowing restaurant owners to make the decision about whether to protect their employees or not. After all, it is up to the restaurant owner to decide whether to be an adult-only or a family-oriented facility. Theoretically, if all restaurant owners decided to cater only to adults, there would be no smoke-free establishments left. While this is obviously not going to happen, it does highlight the capriciousness of a policy whose approach is to base protection from secondhand smoke on whether or not there are children present in an establishment. Such an approach is clearly based on protecting customers (youth customers), not workers. Similarly, a law that allows for smoking rooms within an establishment, even if they are separately ventilated, does not guarantee protection for any workers. Protection is decided, under such an approach, by the restaurant owners who can decide whether to establish a smoking room or not. The approach is, again, clearly intended to protect customers and not workers. Thus, I think that the Indianapolis smoking law is unjustified because it fits into the first example (allowing restaurant owners to make the decision about whether to protect their workers or not by tying smoking in restaurants to their decision about whether to be adult-only or family-oriented). I find the Georgia smoking law to be unjustified because it fits into both examples (basing protection from secondhand smoke for workers on the decisions of the restaurant owners whether to allow youths and whether to establish a smoking room). On the other hand, I think one could make an argument that there is some justification for a law that guarantees protection for a broad class of workers (such as all restaurant workers), but which temporarily exempts a specific group of workers (such as bar workers), where there is a declared intention on the part of policy makers to extend protection to all workers at a later date. I personally could not support such an approach (exempting bar workers) at this date and time because I think public opinion data clearly shows majority support for elimination of smoking in both bars and restaurants and I no longer think it is accurate to argue that social norms do not support the creation of a level playing field of smoke-free establishments (just look at what happened in Ireland if you have any doubts). Nevertheless, I would not criticize advocates who employed such a strategy, assuming that the clear and expressed intention was to extend protection to bar workers at a later time. However, I must criticize advocates who support any policy that does not guarantee protection for a broad class of hospitality workers because I simply do not see any public health justification for a policy that is clearly intended to protect customers rather than workers, and which capriciously exempts certain workers from protection based on business decisions of their employers. Perhaps even more important, though, is the consequences that framing the issue in terms of customer health is going to have on the clean indoor air movement. It serves to set back the movement significantly, and to undermine years of progress in changing social norms in terms of the way the public views the problem of secondhand smoke exposure in bars and restaurants. So I don't opine here that the Indianapolis and Georgia smoking laws should not have been supported by public health advocates because they aren't perfect, but are just good, or a step in the right direction. On the contrary, they are a step in the wrong direction: they represent going backwards in time to when we portrayed this issue as one of customer health, rather than worker health. And they are "bad" public policies, because they represent a regulatory approach that is not justified on any public health grounds. In conclusion, I hope that advocates considering supporting restaurant smoking laws in the future will ask themselves one simple question before deciding whether to support a proposed law: does the policy advance the public's health by guaranteeing protection from a significant health hazard for a broad class of hospitality workers? If the answer is yes, then I think the approach can be justified. If the answer is no, then I hope advocates will think twice before committing to support such an approach. The Indianapolis City Council last night approved a measure that will ban smoking in restaurants, except for those establishments which decide not to serve youths (under age 18). Bars are also excluded from the ban, as long as they serve only adults. The measure represents a compromise from an earlier and stronger ordinance that did not include the exemption for adult-only establishments, but did not have enough support to pass the Council. Public health groups apparently supported the amended ordinance and celebrated its passage. I don't see much to celebrate here; in fact, I think there is reason for grave concern among public health advocates in Indiana and nationally. This measure makes no advances in occupational health protection for bar and restaurant workers in Indiana, and does not even really improve public health protection for restaurant patrons. Think of it this way: Prior to the ordinance, customers could choose whether they wanted to go out to eat at a smoke-free restaurant or not. Their choice of establishments was dictated by the decision of the establishments about whether to allow smoking or not. After the ordinance, customers will still be able to choose whether they want to go out to eat at a smoke-free restaurant or not. Their choice of establishments will be dictated by the decision of the establishments about whether to allow children or not. Thus, the ordinance does not guarantee any improvement in protection from the alleged hazards of secondhand smoke; in fact, if enough restaurants choose to become adult-only establishments, the number of smoke-free restaurants in Indianapolis could actually decrease. I don't think it will - but that's not the point. The point is that the law itself offers no public health protection for restaurant patrons. I do not think it is justified on a public health basis. What about restaurant workers? Prior to the ordinance, workers had no choice whether they would be protected from secondhand smoke exposure on the job. Their exposure was determined by the decision of their restaurant's management. After the ordinance, workers will still have no choice whether they will be protected from secondhand smoke on the job. Their exposure will still be determined by the decision of their restaurant's management. The bill clearly offers no guarantee of protection for restaurant workers, and for those who are unfortunate enough to work in adult-only establishments, levels of carcinogens in their work environments will likely increase, as smokers shift over to frequent these establishments more often. The ordinance clearly has no public health justification on occupational health grounds. So the rest of the story reveals that what we actually have here is a measure enacted in the name of protecting the public's health which has no public health justification, which offers no guaranteed public health protection to anyone - customers or workers - and which will likely result in markedly increased exposure to secondhand smoke for a large group of workers: those employed in establishments that are, or decide to become, adult-only restaurants or bars. Even worse, the fact that the largest city in Indiana has now passed such a measure will serve as a model and a precedent for other communities in Indiana (and throughout the country) to follow. Now, politicians throughout the state know that you can please public health advocates in Indiana by just making sure kids are not exposed to secondhand smoke in restaurants. There is no need to feel any political pressure to protect people from secondhand smoke. This completely undermines the national clean indoor air movement, by framing secondhand smoke as a hazard only insofar as it potentially affects the health and/or comfort of kids. Adult exposure is apparently not a problem or at least not enough of a problem that public health practitioners insist that something be done about it. By inference, I guess the health hazards of secondhand smoke must not be too severe. Otherwise, one wouldn't expect public health advocates to be treating this only as a kids issue. And it certainly is no longer going to be viewed as an issue of occupational health, since workers are completely left out of the scope of health protection. In fact, the situation will likely become much worse for a sizable proportion of Indianapolis bar and restaurant workers. The legacy of Georgia's SB90 has officially begun. Whether the Georgia compromise had any effect on lawmakers in Indianapolis I don't know. But in any case, the combination of these two precedent-setting moves is sure to persuade policy makers in other cities and states that protecting kids is good enough for the anti-smoking groups. The clean indoor air movement in this country has suffered two devastating blows. The Florida legislature has passed a bill that expands the exemption of certain restaurants from the statewide restaurant smoking ban that was approved by Florida voters in 2002. That statewide initiative bans smoking in restaurants, but excludes stand-alone bars, which are defined as establishments that derive no more than 10% of their revenues from the sale of food. Senate Bill 1348, passed by the legislature on May 5, expands this exemption to certain establishments that derive up to 20% of their revenues from the sale of food. What are the "certain establishments" that the bill allows to derive up to 20% of their revenues from the sale of food and still be exempt from the smoking ban? The answer is quite simple: establishments that are listed on the National Register of Historic Places, and which had applied to be on this register no later than 90 days following the effective date of the legislation. Why this seemingly crazy legislation? The answer is apparently quite simple: to provide an exemption from the smoking ban for a single establishment - Sloppy Joe's of Key West - a restaurant/bar in a historic district which derives 17% of its revenues from the sale of food and is thus subject to the current smoking ban - but which, lo and behold, has just applied to be listed on the National Register of Historic Places! While I have argued previously that from a public health perspective, it is important to promote a level playing field such that workers at all establishments are treated equally in terms of health protection, this is far beyond even the unlevel playing field that I had envisioned. The idea of a state legislature, which is entrusted with protecting the health and welfare of the entire citizenry of the state, enacting a measure to exempt a single establishment from a statewide public health law is not only irresponsible but absurd. The measure awaits Governor Jeb Bush's signature or veto. There are some indications that he may veto the bill, as he apparently indicated that he finds the exemption for a single restaurant to be inappropriate. And the legislature is unlikely to override any veto, since the House only approved the bill by a 60-50 vote. However, the damage has already been done. The bill sends a message to bars and restaurants throughout the state that the legislature is ready and willing to provide exemptions, so long as you have the right contacts and the right political clout. While this story will likely simply go down as a crazy anecdote in legislative history, it should send an important message to public health advocates. We must make it clear that health protections are to be applied to all employees and all establishments equally. We must not, ourselves, be in the business of promoting exemptions for certain types of facilities. Doing so sets a terrible example that legislators are sure to pick up on. What is needed and appropriate is a level playing field that provides adequate health protection for all workers. This story underscores the folly of Georgia health groups' decision to support the recently enacted legislation that exempts adult-only restaurants from the state's clean indoor air law and which allows an additional exemption for separately ventilated smoking rooms in restaurants. That decision is going to backfire in the long run. For I'm afraid it sets an example that other states will follow. It sends a message that public health advocates are fine with the idea of setting an unlevel playing field that exempts certain establishments. As long as you're on the long end of the stick in this political game, your restaurant can end up allowing smoking. Health regulation becomes a political game, rather than a matter of principle. The Justice Department last week concluded its testimony regarding potential remedies in its RICO case against the tobacco companies by requesting that the companies be required to fund a $5.2 billion per year national smoking cessation program. The program would include "$3.2 billion annually for quit lines and medications, a $1 billion per year media campaign and another $1 billion per year in research and training." The total cost, over 25 years, would come to $130 billion. While a national smoking cessation program would be of great public health benefit, I do not think that forcing the companies to fund smoking cessation programs is consistent with section 18 U.S.C. section 1964(a) (the civil remedies provision of the RICO statute) and is therefore not likely to be upheld by the Appeals Court. I do not see how funding a smoking cessation program has anything to do with changing tobacco company conduct with regard to the alleged RICO violations. Such a remedy appears to be aimed at "remedying the effects of past conduct to restore the status quo," exactly what the Appeals Court ruled was not permissible under RICO. It's not clear to me how forcing the companies to fund smoking cessation would help prevent and restrain future RICO violations. I have presented an in depth discussion of this issue previously. requiring substantial changes in cigarette labeling and packaging, including larger, stronger, and more graphic warning labels. I think the real question mark in terms of the remedies is the government's request for establishing a series of targets for youth smoking prevalence declines, with penalties assessed to the tobacco companies if these targets are not met. MIT economics professor Jonathan Gruber suggested setting "specific targets to achieve a 60% reduction in youth smoking rates by 2013, with cigarette makers receiving credit for reductions that have been achieved since 1997. For each young adult by which the targets are missed, cigarette makers would be assessed a $3,000 penalty." Since this plan establishes a financial incentive for cigarette companies not to market their products to youths, it can be argued that this remedy is forward-looking and aims to prevent future RICO violations. The potential problem is that youth smoking prevalence is a measure only indirectly tied to future RICO violations. There are a number of reasons why youth smoking prevalence targets may not be met, of which continued marketing to youths is only one. So it is unclear whether the D.C. Appeals Court would find this remedy to be consistent with 18 U.S.C. section 1964(a). But other than directly establishing requirements for cigarette marketing and labeling, it is the only meaningful remedy (and the only monetary one) that I think has any chance to be upheld. A coalition of medical and public health groups which calls itself "Partners for Effective Tobacco Policy" has sent a letter to members of Congress which purports to inform policy makers about the FDA tobacco legislation (H.R. 1376 and S. 666) that has been introduced into the 109th Congress. The letter, dated April 7, compares the authority that FDA would be given to regulate tobacco products with existing authority that the Agency has to ensure the safety of other products. The coalition, which is headlined by the Campaign for Tobacco-Free Kids, the American Cancer Society, the American Lung Association, and the American Heart Association, also includes a number of other important groups which co-signed the letter, such as the American Public Health Association, American College of Preventive Medicine, Association of Teachers of Preventive Medicine, Society for Public Health Education, American College of Physicians, American College of Cardiology and the American College of Chest Physicians. In comparing the authority that FDA would be given to regulate tobacco products with existing powers FDA has to regulate the safety of other products, the letter states that H.R. 1376/S. 666 provides "FDA with authority over tobacco products similar to the authority it has over other products. FDA would have the authority to stop tobacco marketing and sales to our children and to subject tobacco products to the same consumer protections, such as ingredient disclosure, product regulation and truthful packaging and advertising, applied to other products. Just as we entrust FDA with the authority to approve every ingredient in food to ensure safety, we should give FDA the same authority to regulate tobacco products." This letter is misleading and deceptive and will likely have the effect of providing members of Congress with an inaccurate understanding of the nature of the proposed legislation. Any organization that signed on to this letter having first read the text of the letter should be ashamed of itself and I think owes the public health community an apology. I also think that each organization and/or the Partners coalition itself is obligated to send a letter of clarification to our policy makers. I think the letter represents unethical public health conduct, and violates the basic code of public health ethics. Why? Because the letter misrepresents the nature of the legislation in a profound way, and any professional medical or public health organization that read the letter should have been aware of this. Thus, signing on to the letter must be presumed to represent a willful (i.e., intentional) attempt to deceive policy makers about the true nature of the legislation. The letter states that the legislation would provide FDA with authority over tobacco products that is "similar to the authority it has over other products." This is, frankly, a bunch of crap. In no way is the authority provided to FDA in this legislation similar to that provided to the Agency for the regulation of other products, such as food and drugs. In fact, it is fundamentally different. If any of the organizations took the time to read the bill before signing on to the letter, they would have immediately had to notice the very first major provision of the legislation. Section 901(a), entitled "FDA Authority over Tobacco Products," reads: "Tobacco products shall be regulated by the Secretary under this chapter and shall not be subject to the provisions of chapter V." And what is chapter V? It is the entire regulatory authority for ensuring the safety of drugs and devices. And the bill itself does not give FDA the major aspects of the authority it has over food and drugs. As I think should be obvious, it is very clear that the FDA legislation does not give the Agency authority over tobacco products "similar to the authority it has over other products." In fact, the authority is about as different as one could imagine. It is also clear that the legislation does not "subject tobacco products to the same consumer protections...applied to other products." This statement, in fact, comes dangerously close to being not just misleading, but grossly inaccurate. And the statement that "Just as we entrust FDA with the authority to approve every ingredient in food to ensure safety, we should give FDA the same authority to regulate tobacco products" implies that the FDA legislation would give FDA authority to "approve every ingredient" in cigarettes, which is completely false. "Public health institutions should provide communities with the information they have that is needed for decisions on policies or programs and should obtain the community’s consent for their implementation. ... there is a moral obligation in some instances to share what is known. For example, active and informed participation in policy-making processes requires access to relevant information. ...Such processes depend upon an informed community. The information obtained by public health institutions is to be considered public property and made available to the public." The letter has not only failed to inform members of Congress of the critical differences in the regulatory system that H.R. 1376/S. 666 sets up for tobacco products compared to FDA's authority over food and drugs, but even worse, it has completely misled them about these differences. Note that I am not arguing here that the FDA legislation should necessarily give the Agency authority that is similar to its authority over food and drugs. Such a regulatory framework would most likely require tobacco products to be removed from the market. But the Partners' misrepresentation of the nature of FDA authority over tobacco products as provided by this legislation is inappropriate, irresponsible, and unethical. I would certainly hope and expect to see a retraction and apology for this letter, either by the entire coalition as a whole, or by each of the 34 organizations that should feel ashamed for having taken part in such a deceptive and inappropriate lobbying endeavor. ...Bill Godshall, Executive Director of Smokefree Pennsylvania. I cannot think of anyone in the tobacco control movement who has done more for the public's health and for the movement itself, with extremely limited funding, than Bill Godshall. Bill founded SmokeFree Pennsylvania in 1990, and for the past 15 years has served as its executive director. SmokeFree Pennsylvania, under Bill's leadership and on a shoe-string budget, has successfully advocated for clean indoor air policies, tobacco marketing restrictions to youth, and nicotine addiction treatment services. Although originally formed as a statewide grassroots organization, Bill has expanded SmokeFree Pennsylvania and has become so prominent and important a member of the tobacco control movement that the organization is a major part of most discussions over national tobacco control policy initiatives. Bill also maintains an email network (the Bill Godshall Announcement List) which provides timely information and critical analysis of the most important national and local tobacco control policy issues to more than 17,000 public health advocates throughout the country. There have been nearly 1,500 messages posted by Bill to this network of local advocates. Although Bill's contributions to the movement are too numerous to mention, several highlights stand out to me. Bill played an instrumental role in the successful effort to derail the proposed Congressional $368.5 billion tobacco bailout in 1997, which would have given the tobacco industry immunity from any meaningful legal liability. Had the settlement been enacted, the Engle case, which resulted in a jury verdict of $145 billion against the tobacco companies, would never have seen the light of day. In fact, the many recent victories of plaintiffs against the tobacco companies would never have occurred, and the landscape of how the public views the tobacco industry today would be markedly different. Bill played an instrumental role in the development of the Save Lives, Not Tobacco coalition, in which 156 public health organizations joined together to oppose the global bailout. Bill served as the coalition's communications director, and was highly successful in obtaining national media attention that highlighted the fact that the tobacco settlement would have shielded the industry from class action lawsuits and punitive damages, obstructing the pursuit of justice by affected smokers for all time to come. Bill was featured in a number of sentinel articles, including a critical August 1, 1997 article in the Wall Street Journal: Grass-roots activists try to derail tobacco settlement (page A16). In the book Smoke in their Eyes: Lessons in Movement Leadership from the Tobacco Wars, Bill was described as a "scourge" who was "energetic" and "relentless," and for whom "descrediting and blowing apart ENACT was a labor of love and he dedicated himself to that task." Bill is described as one of the three harshest critics of the global bailout, along with the American Lung Association's John Garrison and Public Citizen's Alan Morrison. A second highlight is Bill's tremendous contributions and leading role in what was ultimately an unsuccessful effort to convince the Attorneys General to oppose the Master Settlement Agreement deal. In retrospect, Bill must be viewed as having had tremendous vision for his accurate analysis of the likely effects of the deal. A third highlight is Bill's central role in the successful effort to derail the proposed FDA tobacco legislation during the 2004 Congressional session, and his continuing efforts to kill this Philip Morris sweetheart deal during the current session. A fourth highlight is Bill's role in helping to expose the tobacco industry's sponsorship of legislation to criminalize or penalize young people for smoking. He was featured in a 1999 CBS 60 Minutes episode that publicly exposed this issue. Most recently, Bill miraculously was the only individual to recognize that the state of Pennsylvania had inadvertently repealed its preemption of clean indoor air legislation. His current efforts to bring this to light will most certainly result in major public health advances in his home state. What I admire most about Bill is the fact that he tells it like it is. He does not back down from the truth and from what he believes is right. He is not afraid to go up against anyone, whether it is the tobacco industry or even our own public health organizations at times when he feels they are acting inappropriately. And all of his efforts and accomplishments have been realized with little more than his own initiative and determination, and his own self-funding. While most of us require a budget and substantial funding to accomplish what we do, Bill does even more, and he has done it with little funding. Perhaps the best quote to demonstrate Bill's approach is from a May 23, 2000 Pittsburgh Post-Gazette article, in which Bill was debating University of Pittsburgh Cancer Institute director Ronald Herberman over the importance of allocating a substantial portion of tobacco settlement funds for smoking prevention and cessation programs. Herberman wanted the majority of tobacco control funds to go to research, stating that more research was needed on why people smoke and that most tobacco control programs were a waste: "We don't believe that the state of the art, the current billboards or media campaigns and so forth, are nearly close enough to address some of the problems." Bill's response was: "The state of the art is in California, Florida, and Massachusetts. The problem is we need to get some of the state of the art in Pennsylvania -- we don't have the state of the art because Herberman is lobbying against it." For his dedication and his accomplishments, and in recognition of his receipt of the Rest of the Story's Tobacco Control Advocate of the Year award, Bill will be awarded a prize of $368.50, one dollar for each of the billion dollars that would have enabled a bailout of the tobacco industry had Bill not been active in the tobacco control movement. While I have already commented on the Citizens' Commission to Protect the Truth's failure to be forthright in disclosing its conflict of interest (specifically, being affiliated with and funded by the American Legacy Foundation) in its filing of its recent amicus brief in the legal dispute between Lorillard and the American Legacy Foundation over whether the "truth" campaign violated the anti-vilification clause of the Master Settlement Agreement, I think the merits of the actual legal argument in the brief are also worthy of comment. The background to the brief is as follows: Lorillard (maker of Newport, among other cigarette brands), has threatened to sue the American Legacy Foundation for violating the terms of the Master Settlement Agreement through its "truth" anti-smoking campaign. Specifically, Lorillard contends that the "truth" campaign ads violate the anti-vilification clause of the settlement agreement (section VI[h]), which states that: "The National Public Education Fund shall be used only for public education and advertising regarding the addictiveness, health effects, and social costs related to the use of tobacco products and shall not be used for any personal attack on, or vilification of, any person (whether by name or business affiliation), company, or governmental agency, whether individually or collectively." The American Legacy Foundation has apparently filed a motion in the Court of Chancery of the State of Delaware to attempt to restrain Lorillard from filing suit on the above basis. The basic argument advanced by the Commission in the amicus brief, which supports the Foundation's motion, is that: "If Lorillard, and tobacco companies generally, are permitted to threaten and bring suit against the American Legacy Foundation every time it feels that a truth(R) campaign advertisement will impact its sales, the adverse effect on the public health will be vast. ... Rather than placing its resources and energy into generating powerful, effective anti-smoking advertisements, the American Legacy Foundation would be forced to appease the tobacco companies under the threat of litigation." Importantly, the brief also states that: "Merely entertaining this suit, and others of its type, will impact Legacy's truth(R) campaign. Putting aside the possibility of a declaration that the truth(R) campaign violates the anti-vilification provision of the MSA, the mere threat of such lawsuits will carry, practically speaking, the same effect." And it concludes by stating: "The only way for this Court to preserve the effectiveness of Legacy's truth(R) campaign, and thereby allow the nation's most successful smoking prevention campaign to continue its efforts, is to declare and decree that Lorillard cannot bring suit against Legacy pursuant to the MSA." As much as I deplore Lorillard and dislike its attempt to invoke the anti-vilification clause of the MSA, the key legal issue in question is not whether Lorillard is a terrible company or not or whether allowing it to sue Legacy will ultimately harm the public's health, but whether it is reasonable and legally sound under the Master Settlement Agreement and the laws of the United States to allow such a lawsuit. While the Commission is at least somewhat accurate in defending the importance of the "truth" campaign (see more on this below) and in noting that allowing Lorillard and other companies to sue Legacy based on the anti-vilification clause might weaken or even devastate the campaign, that is unfortunately not the central legal question here. The main question is whether a lawsuit is allowable and reasonable under the law, which includes the contract under which the two parties are acting. In order to convince a judge not to allow this lawsuit, I think that the Commission would have to show that either: (1) there is no legal basis for Lorillard to sue Legacy on the alleged anti-vilification clause violation under the MSA; or (2) that although a lawsuit is allowable, this suit is so frivolous or unreasonable that allowing it would undermine the operation of the Foundation for little meaningful reason. The amicus brief does not attempt to make any argument to support the first point, although it certainly asks the judge to make such a declaration in requesting a decree that "Lorillard cannot bring suit against Legacy pursuant to the MSA." The brief does argue that allowing a lawsuit would undermine the operation of the Foundation, but it provides no analysis or evidence to support the contention that such a lawsuit would be frivolous or unreasonable in any way, other than to simply state that it would cause problems for Legacy. But that alone does not seem enough to restrain Lorillard from filing suit under the MSA if its legal contention is at least reasonable (note that it does not have to be correct, just reasonable). It seems clear that Lorillard does have a basis to assert claims against Legacy pursuant to the MSA (the Attorneys General have certainly been given the ability to assert claims against the tobacco companies under the MSA; it seems that the contract would work both ways). So the question is whether Lorillard's invokation of the anti-vilification clause is unreasonable. Is, as the Commission claims, Lorillard simply trying "to intimidate Legacy under the guise of anti-vilification provisions." Here, a careful reading of the anti-vilification provision is critical. The clause states that the Foundation's ads must not make "any personal attack on, or vilification of, any person (whether by name or business affiliation), company, or governmental agency, whether individually or collectively." To vilify is defined as either "to lower in estimation or importance" or "to utter slanderous and abusive statements against." While I personally would not interpret the anti-vilification clause in such a way that it would lead to a conclusion that some of the "truth" campaign ads have violated the provision, I do have to admit that it does not seem unreasonable to argue that some of the ads do attempt to lower the public's estimation of the tobacco companies. So I think the significant legal question for a court to determine is whether the definition of "vilify" would fall under the first (more general) or second (more specific) definition above. Under the first definition, it may not be unreasonable to interpret the MSA in such a way that the "truth" campaign ads represent a violation of the clause. Under the second definition, the "truth" campaign is home-free. The problem is that it is not up to me to decide how to interpret the MSA. 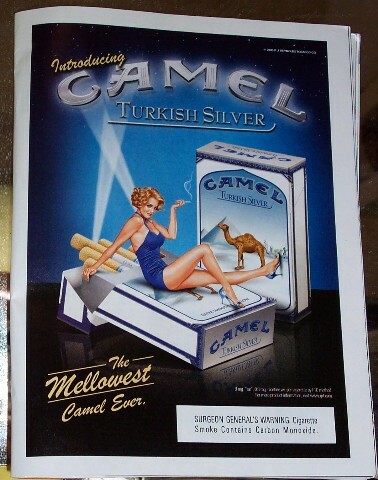 The relevant question is really whether there is a legitimate potential legal argument that the ads could violate the MSA, such that a court's hearing of the issue becomes essential for the tobacco company's interest in pursuing legal enforcement of the binding contract that both parties are subject to. And I think because there is at least the possibility of a more general interpretation of the anti-vilification clause, a lawsuit on this basis is not frivolous, but is within the realm of reason. I therefore am not persuaded by the Commission's legal brief. If anything, I think that it is in the best interests of the public's health in the long run to defend the legal system and the opportunity for parties to pursue justice under the laws of our nation. To cut off or restrain the legal ability of the tobacco companies to seek justice under a contract that is legally binding, just because the companies are very bad and we are very good, does not advance the overall interests of public health in the long run. And, frankly, I think it may violate legitimate legal rights of the tobacco companies. Yes, I do think that all entities in our society do have certain legal rights that cannot be stripped away simply on the basis of their being faulty in intention or action. What is really needed in this case is not a blanket request to the judge to interfere with Lorillard's apparent legal rights, but rather a compelling argument why the judge should rule that Legacy has not violated the anti-vilification clause. It seems to me that it is going to basically come down to which of the two basic definitions the judge adopts and evidence that it is indeed the second definition that is more appropriate in this situation, based on the context in which the MSA was negotiated and signed, would be truly valuable in helping Legacy to preserve the integrity of the "truth" campaign. One additional statement in the brief deserves comment. The Commission wrote that: "It is beyond dispute that the truth(R) campaign's advertising is cutting-edge, and has caused a significant decrease in youth smoking." While there is no doubt that the "truth" campaign is cutting-edge, I certainly do not think that it is beyond dispute that the campaign has significantly decreased youth smoking. Dr. Joel Moskowitz has published an important comment noting that the paper cited in the amicus brief to support the above statement had several limitations that may interfere with the ability to conclude that the campaign had a significant effect. And I have myself argued that the evidence presented in the AJPH paper does not support the conclusion that the "truth" campaign led to a significant reduction in youth smoking. Whether Moskowitz and I are correct or not, it does not seem accurate under the circumstances to claim that the campaign effects on youth smoking are "beyond dispute." They are in fact being disputed, and by reputable sources (well, at least one). Finally, let me be clear that I am not criticizing the Citizens' Commission for advancing its argument. It has a legitimate interest in doing so, and there's nothing wrong in it pursuing this approach. It's at least slightly possible that the approach may work. My argument here is not that the amicus brief is inappropriate (other than the failure to be forthright about the Commission's affiliation with Legacy). My argument is that the brief is not particularly relevant or valid. The real blame here lies with the Attorneys General who signed such a shoddy agreement in the first place as well as with the public health organizations that failed to unequivocally oppose the signing of the settlement. Unfortunately, if you sign a really bad contract you have to live with your mistakes. The Attorneys General, in signing an agreement with the anti-vilification clause present, presumably knew full well what they were getting themselves into. 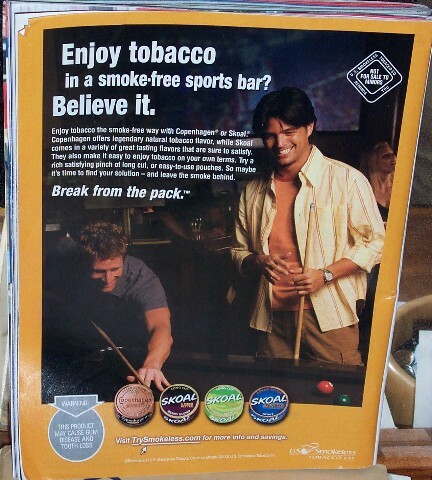 It shouldn't come as any surprise that the tobacco companies wanted that clause in there so that they could attempt to prevent exactly the kind of hard-hitting ads that Legacy is producing. That "rather than placing its resources and energy into generating powerful, effective anti-smoking advertisements," the American Legacy Foundation is now "forced to appease the tobacco companies under the threat of litigation" is not a violation of legal principles in this country. Instead, it is simply the result of a really bad contract that should never have been signed in the first place. Unfortunately, it is the anti-vilification provision itself that is the problem here, not simply the fact that the tobacco companies have bad intentions. The companies were successful in extracting such an advantageous provision in the contract. They certainly have the right to now take advantage of that provision, and I don't blame them for doing so. Legacy and the Commission can complain all they want about how evil Lorillard may be, but it is the Attorneys General who signed the contract knowing full well about the anti-vilification clause who are to blame for this mess. Citizens' Commission Still Not Revealing the Truth; How Can It Be Expected to Protect the Truth? In its latest amicus brief, this time filed in support of the American Legacy Foundation's position in a legal battle with Lorillard regarding whether the "truth" anti-smoking campaign violates the anti-vilification clause of the Master Settlement Agreement, the Citizens' Commission to Protect the Truth denies any affiliation with the Legacy Foundation. In its previous amicus briefs, the Citizens' Commission failed completely to reveal its financial relationship with the American Legacy Foundation. According to the Commission's web site: "Principal funding for The Commission comes from the National Association of Attorneys General (NAAG) through a $1.5 million pass-through grant from the American Legacy Foundation." Now, the Citizens' Commission is finally disclosing that its funding comes from NAAG through Legacy, but it is denying that it is affiliated with Legacy, basing this claim on the contention that the NAAG funds are being transmitted to the Commission through Legacy purely as an administrative function: "The Commission is not affiliated with Legacy. It is an independent organization developed to serve the public health in connection with tobacco use and prevention. Funding for the Commission was provided by the National Association of Attorneys General, and was transmitted to the Commission through Legacy purely as an administrative function." The Citizens' Commission's claim that it is not affiliated with Legacy is supported in the amicus brief by reference to a March 18 letter from Attorney General William Sorrell (president of NAAG) to Dr. Joseph A. Califano, Jr., Chairman and President of the National Center on Addiction and Substance Abuse at Columbia University (CASA) and Chairman of the Citizens' Commission, stating: "This letter is to confirm that the funding for the Citizens Commission to Protect the Truth was initially provided by NAAG to the American Legacy Foundation with the belief that they would be used for support to the Commission." My initial impression upon seeing that the Citizens' Commission did indeed, for the first time in one of its amicus briefs, address the issue of its funding from the Legacy Foundation, was that the Commission was finally revealing the truth and disclosing its conflict of interest in arguing on behalf of the Foundation. However, to my surprise, the Commission does just the opposite: it reveals the funding but then goes on to claim that it is not affiliated with Legacy. Rather than revealing the truth, this amicus brief actually attempts to obscure and hide the truth. "funding for the Citizens Commission to Protect the Truth was initially provided by NAAG to the American Legacy Foundation with the belief that they would be used for support to the Commission." It doesn't take a legal scholar or any stretch of the English language to conclude that the Citizens' Commission receives its funding from the American Legacy Foundation, and that the funding originates from the National Association of Attorneys General. So how can the Commission possibly claim that it "is not affiliated with Legacy"? It receives funding from Legacy. That represents, in its most basic form, an affiliation (and a strong one, at that). The word "affiliated" is defined as "closely associated with another typically in a dependent or subordinate position." Since the Commission receives funding from Legacy, it follows that the two organizations are "closely associated." And the fact that the Commission's funding comes from Legacy does represent the typical "dependent" position to which the definition refers. The exhibit (i.e., the letter from NAAG to the Commission) offered in the brief to support the contention that there is no affiliation between the Commission and Legacy demonstrates just the opposite. It makes it eminently clear that the two are strongly affiliated via funding from NAAG to Legacy that was specifically provided to "support the Commission." The Commission's argument that there is no affiliation between itself and Legacy because the funding from NAAG was transmitted to the Commission through Legacy "purely as an administrative function" is ridiculous. One could just as easily argue that university faculty members who are supported by the Association of Schools of Public Health (ASPH) STEP UP program (which is funded by Legacy through a grant to ASPH) are not affiliated with ASPH because ASPH serves purely an administrative function in transmitting Legacy's funds to the grant recipients. Attorney General William Sorrell, the President of NAAG, is also the Treasurer and a Board member of the American Legacy Foundation. So even if the NAAG funds went directly to the Citizens' Commission, there would still be an affiliation with Legacy by virtue of Sorrell's dual role as a chief executive of both NAAG and Legacy. According to the Master Settlement Agreement, NAAG provides for the very creation of the American Legacy Foundation and two of its representatives automatically sit on Legacy's Board of Directors. Once again, even if NAAG directly funded the Commission, there would still be an affiliation with Legacy by virtue of the fact that NAAG is inextricably tied to Legacy - it is the creator of Legacy. CASA, the organization of which Dr. Califano is Chairman and President and which essentially serves as the recipient of funds to run the Commission, is itself funded by the American Legacy Foundation, according to its 2004 Annual Report. Rather than clarifying and disclosing its conflict of interest in submitting the amicus brief, the Citizens' Commission has now made a deliberate attempt to obscure and hide the extent of its true affiliation with Legacy. In some ways, this is even worse. Previously, the Commission was simply failing to reveal the affiliation. It was an error of omission. Now, the Commission is trying to use a ridiculous argument to obscure or hide the affiliation. This is now an error of "commission." What is most disturbing about the latest Citizens' Commission action is not just the attempt to obscure the truth. It is the hypocrisy of the Commission representing itself, on the one hand, as an organization dedicated to "protecting the truth," and then on the other hand, trying to mislead a judge about the truth of its affiliation and its apparent conflict of interest in an important legal case. How can the Citizens' Commission protect the truth if it has so much trouble telling the truth? According to an article in the current issue of Business Week, Philip Morris has invoked yet another loophole in the Master Settlement Agreement (MSA) in an attempt to substantially lower its payments to the states, threatening not only current state budgets but also state reserves that may need to be tapped to fulfill bond obligations in states that have securitized MSA payments (see: Foust D, Byrnes N. The high cost of nicotine withdrawal: cigarette makers want settlement rebates from states. That could hurt taxpayers. Business Week, May 23, 2005, p.40). According to the article, if all major participating manufacturers invoke the loophole, states may have to pay back as much as $1 billion to the tobacco companies immediately, with further rebates or payment reductions in years to come. The article predicts that such an outcome would result in severe consequences for states that have issued bonds backed by future MSA payments; 12 states, plus Puerto Rico and the District of Columbia have issued $19 billion in such bonds. If future MSA payments drop, these states may need to tap into reserve funds in order to avoid defaulting on these bonds. Thus, the loophole creates an enormous economic incentive for the states not to do anything that will decrease tobacco company revenues. The attorneys general are apparently planning to contest the request for these MSA rebates, claiming, according to the article, that tobacco companies must "prove the states were negligent in policing the settlement." The loophole in question is the Non-Participating Manufacturer (NPM) Adjustment, a complex provision described in section IX(d)(1) of the Agreement. Basically, the provision states that if the market share of the participating manufacturers in any given year falls to more than 2 percentage points below the baseline aggregate market share for 1997, then MSA payments for the following year are reduced by a percentage equal to the amount of the market share loss exceeding 2 percentage points (that is, the market share loss minus 2 percentage points) times a factor of 3. However, there are two exceptions to this adjustment. First, it does not hold if total domestic cigarette consumption is greater than it was from the participating manufacturers in 1997. Since cigarette consumption is falling, this is unlikely to occur and so will not nullify the NPM adjustment. Second, the adjustment only holds if the market share loss in any given year is at least partially a result of disadvantages to the participating manufacturers due to their participation in the MSA. Such a determination is to be made by "a nationally recognized firm of economic consultants." As an example to demonstrate the provision, assume that the market share for participating manufacturers was 99.6% in 1997 and dropped to 91.9% in 2004 (these are the data cited in the Business Week article). The market share loss that exceeds 2% is 99.6-91.9-2.0, or 5.7%. The adjustment factor is then 5.7% times 3, or 17.1%. This means that total industry payments to the states will be reduced by 17.1% in 2005, assuming that domestic cigarette consumption is not higher than it was in 1997 and that the nationally recognized firm of economic consultants determines that participation in the MSA was a significant factor in the loss of market share by the participating manufacturers for 2004. Based on the $6.2 billion paid to the states in 2004, this would represent a loss of about $1.1 billion in state revenue. Although the attorneys general are apparently going to fight the cigarette companies' request for this rebate, I don't see that they have much of an argument. Although complex, the non-participating manufacturer adjustment is quite clear. The only defense that the attorneys general appear to have is if they can correctly claim that the MSA was not a significant factor in the loss of market share for the participating manufacturers. However, given the magnitude of the payments being required under the MSA, it is difficult to imagine that a panel of economic consultants would not find that participation in the MSA was indeed a significant factor why non-participating manufacturers were able to make market share gains. The argument, mentioned in the article and attributed to the attorneys general, that companies need to prove that the states were negligent in policing the settlement in order to make the NPM adjustment does not seem to be valid. It appears to me that the only issue up for consideration is whether or not being a party to the MSA was a significant factor in the loss of market share. My sense is that if this goes to an economic panel or to the courts, the tobacco companies will be successful in their attempt to collect the NPM rebates that are due to them. All of this supports my earlier contention that the MSA represents the greatest public health blunder of my lifetime. Now, more than ever, the financial well-being of the states is inextricably tied to the economic health of the major tobacco companies, creating an overwhelmingly compelling incentive for the states not to enact any policies or take any actions that may endanger the sales and/or profits of the major tobacco companies. The states are now economic partners with the tobacco companies and as such, deserve a share of the blame for the most important epidemic of the 21st century. In a May 4 commentary in USA Today, R.J. Reynolds executive vice president for external relations Tommy J. Payne opined that the proposed FDA legislation would destroy any motivation on the part of tobacco companies to develop reduced risk products. Payne suggested that the main effect of the legislation would be to freeze existing market shares, which would of course benefit Philip Morris, the existing market leader. According to Payne: "USA Today's readers need to know that FDA control of the tobacco industry would extend well beyond efforts to reduce risk and would, in fact, seriously impede future progress along those lines. Passage of FDA-tobacco legislation like that proposed last year would virtually destroy competition in the tobacco industry, including motivation to develop reduced-risk products. It would grant unlimited power to the industry market leader, locking in existing market share trends and the status quo." Although one must always exercise caution when interpreting public statements from tobacco company spokespersons, this statement from R.J. Reynolds does appear to support the assertion, expressed previously in The Rest of the Story, that passage of the FDA legislation would stifle competition to produce truly reduced risk cigarette products and take away any real incentive for tobacco companies to develop and market products that might actually result in substantial reductions in health risks. It also supports the assertion, expressed earlier, that the FDA legislation really represents what would better be called the "Marlboro Monopoly Act." This is, above all, not a bill to protect the public's health, but a bill to protect and preserve the financial interests of the nation's leading tobacco company. The Georgia "Smokefree" Air Act of 2005 could result in extremely hazardous working conditions for many restaurant workers in the state, thanks to a major loophole that essentially nullifies any guaranteed health protections in the bill. In addition, this loophole is sure to cause confusion and delay, and to create an expensive alteration of the restaurant environment that will lead to an unlevel playing field for restaurant owners and employees alike. The loophole is exception 9B, which exempts from the smoking law any "private rooms in restaurants and bars if such rooms are enclosed and have an air handling system independent from the main air handling system that serves all other areas of the building and all air within the private room is exhausted directly to the outside by an exhaust fan of sufficient size." The loophole is already causing confusion and uncertainty, and some restaurants are apparently prepared to establish enclosed smoking areas for their patrons. Perhaps the folly of public health advocates supporting such an inconsistent approach to the regulation of a supposedly dangerous health hazard is expressed best by one Gainesville restaurant owner, who is quoted in a Gainesville Times article as stating: "I don't like the gray area we have in the law. Either you do or you don't allow smoking." He's exactly right. As I argued previously, either secondhand smoke is or is not a significant health hazard for which all employees deserve protection. Senate Bill 90 creates an unlevel playing field, in which no employee is guaranteed protection, workers in bars and restaurants are treated differently, workers are treated differently depending on the nature of the patrons they serve and on whether their employers are financially well-off enough to afford the creation of a separately ventilated smoking area. But loophole 9B could be an extreme problem because it essentially nullifies even the weak health protection that SB90 might otherwise provide. Because there is no size limit on the allowed smoking areas, restaurants may presumably create smoking rooms that take up most of the seating capacity of their establishments. It is even conceivable that the legislation actually allows the designation of an entire restaurant as a smoking room, as long as the room is considered private and is ventilated directly to the outside. The critical point for interpretation is the meaning of the phrase "private room." Not only is this phrase not defined in the bill, but it is not referring to establishments such as "private clubs" in other legislation, for which there is a definition available in the statutory language that allows the creation and/or licensing of such establishments. Given the absence of any definition for this term, courts are likely to adopt the broadest of possible interpretations, which would essentially mean that a restaurant could create a smoking room that occupies the substantial majority of the seating capacity of the facility. Because the carcinogen levels in enclosed smoking rooms are extremely high, SB90 represents an extreme health hazard to the employees who will have to serve in such areas. In fact, epidemiologic data suggest that this law will cause more health damage because of the pollution chambers it will create for many restaurant workers than any health benefits it may offer for restaurant workers who are fortunate enough to work in an establishment that cannot afford to create a separately ventilated smoking room. In a 1995 issue of Tobacco Control, I and fellow researchers at CDC estimated that this type of policy will actually cause more deaths than lives saved (see: Siegel M, Husten C, Merritt R, Giovino G, Eriksen M: The health effects of separately ventilated smoking lounges on smokers: Is this an appropriate public health policy? Tobacco Control 1995; 4:22-29). Thus, the loophole in this legislation could not only nullify the health protections offered to Georgia workers by this bill, it could actually create hazards that did not exist prior to the legislation. One of the central tenets of medicine and public health is the expression "First, to do no harm." The passage of Georgia's inconsistent and nonsensible workplace smoking law violates this principle of public health practice by creating harm for many of the very workers who this law is supposedly aiming to protect. While public health practitioners in Georgia are not to blame for the enactment of the law, they still chose to support the law's enactment, despite its inconsistencies, the unlevel playing field it creates, and the harm that it is going to cause for many restaurant workers. I do not think this is the way we should be practicing public health, and I certainly hope that public health advocates in other states will avoid a replay of this saga. During testimony at today's DOJ tobacco trial, the American Legacy Foundation's inappropriate tactics to increase its funding, reported earlier (post1 post2) here at The Rest of the Story, were publicly exposed. These tactics have included injecting itself as a party into the DOJ trial, using a front group (The Citizens' Commission to Protect the Truth) to create the appearance of independent citizens' support for Legacy funding, and relying upon a legal brief from its front group that has little legal merit but is ostensibly just an attempt to use the DOJ case to try to extract funding for the Foundation. According to a Dow Jones article, Philip Morris lawyer Dan Webb suggested to the Court that the American Legacy Foundation was "'angling' itself into the government's fraud case against cigarette makers in hopes of obtaining more funding." Webb explained that "ALF began a plan to find a way to leverage its ability to engage in tobacco litigation...and use that as a way to get more money" for the organization. According to the article, "Legacy testified in written direct that the group, set up in March 1999, 'is facing what can only be called a financial crisis'" but denied that its testimony is motivated by that financial concern, "stating ALF 'has absolutely not been offered anything in return' for its testimony." However, Webb pointed out that "the Citizens Commission to Protect the Truth, which receives much of its funding from ALF, filed a brief asking District Court Judge Gladys Kessler, who is hearing the nonjury trial, to consider long-term, industry-funded youth prevention campaigns through ALF as a remedy, should she rule that tobacco companies fraudulently denied smoking's health risks in the past and are likely to act fraudulently in the future." Although I disagree with most of Webb's legal arguments in tobacco cases and have personally confronted him and his legal team many times in the courtroom, I think that he is right on the mark in his perception of the American Legacy Foundation's role in the DOJ case. While the Legacy Foundation has possibly succeeded in pulling the wool over the eyes of much of the public health community, its inappropriate, unethical, and shameless tactics were finally exposed publicly in the courtroom by an astute lawyer who could see a spade for a spade. If my analysis which revealed the lack of a reasonable legal argument in the Citizens' Commission amicus brief was not enough to expose what is really going on here, the proof is in the words of the Commission itself, which, according to its web site, plans to "file amicus briefs in appropriate tobacco litigation. It will ask courts to order tobacco companies to provide funds for the truth® campaign as one of the remedies for tobacco company misconduct." There is no doubt here about what is going on. The web site does not state that the Citizens' Commission has information that would be valuable and relevant to the Court in certain tobacco litigation and that it therefore will seek amicus status. No - the web site makes it clear that the filing of amicus briefs is merely a strategy to pursue funding for Legacy's truth® campaign. This is not about the American Legacy Foundation acting in the interest of the public's health. This is not about the Foundation providing valuable and relevant legal arguments. It is clearly about Legacy using the DOJ case as a vehicle to try to increase funding for itself. The end here is not public health or justice; it is simply the securing of funding to continue the "truth" campaign. And the means here is not the appropriate practice of public health; it is the use of deceptive tactics for self-promotion. The "truth" has finally come out. The Georgia Smokefree Air Act of 2005 was signed by Governor Sonny Perdue Tuesday, and will become effective on July 1. The bill has been described in the media as a widespread "smoking ban" that leaves only a "handful" of public places where smoking will still be allowed. It has also been described as a "public health measure," and as a great "success" for the state of Georgia. First, it is important to be clear about what the Georgia law does and does not do. It does not ban smoking in all bars and restaurants. It does not ban smoking in all restaurants. It does not ban smoking in all restaurants at which minors are allowed. What it does is restrict smoking in restaurants at which minors are allowed to enclosed, separately ventilated areas of any size, in which employees work, with no restrictions on smoking in adult-only restaurants or bars. As I have documented, the levels of secondhand smoke in the newly-created separately ventilated smoking areas are going to be extremely high and are likely to cause severe, adverse health effects for the unfortunate restaurant workers who are forced to work in such areas (see: Siegel M, Husten C, Merritt R, Giovino G, Eriksen M: The health effects of separately ventilated smoking lounges on smokers: Is this an appropriate public health policy? Tobacco Control 1995; 4:22-29). So this is hardly a widespread smoking ban and it hardly leaves just a "handful" of public places where people can smoke. Second, while the original bill introduced into the legislature was a public health measure, I don't view this highly contrived patchwork of legislation that guarantees protection to not a single worker in the state of Georgia to be a public health measure. First of all, it is not designed to protect people from secondhand smoke. It specifically chooses to protect only youths from secondhand smoke and to exclude adults from such protection. I don't see any public health rationale behind an approach that is based on a premise that carcinogens are very bad for kids but acceptable for adults. Second of all, it is not designed to protect workers from secondhand smoke, just patrons. But patrons can choose to eat at a smoke-free restaurant if they want. We don't really need the legislature to intervene to create more smoke-free choices for customers. If we need anything, it is for the legislature to intervene to ensure a smoke-free working environment for all employees. I simply don't see a strong public health rationale behind an approach that is based on a premise that carcinogens are very bad for customers, but acceptable for workers. 1) The bill clearly frames secondhand smoke as a problem of youths, but not adults. The whole focus on restricting smoking only insofar as to protect youths from being exposed is based not on any defensible public health rationale, but more on some sort of political feasibility rationale. I think it does damage, because it sends the message that secondhand smoke exposure is only a problem insofar as it affects youths. The very message that is sends condones and institutionalizes adult exposure to carcinogens as an acceptable way of life. 2) The bill clearly frames secondhand smoke as a problem of customers, but not workers. The whole focus on restricting smoking only insofar as to protect customers from being exposed is based not on any defensible public health rationale, but also on some sort of political feasibility criterion. In fact, it is the workers who need the protection the most - not the customers. While the customers may be present for a couple of hours at a time, workers are likely there for 40 or more hours per week. I am seriously concerned about how the framing of this legislation is going to affect efforts in other states. By creating this youth-only focus, I'm afraid the Georgia experience is going to give legislators in other states a nice political out that they may not have previously had. If this approach spreads beyond the Peach State, it will be a public health disaster. First, because lots of opportunities to provide real, guaranteed protection for all citizens - adults and kids alike - and for employees as well as patrons will go down the wayside. Second, because this inconsistent and largely unjustified public health approach makes public health practitioners everywhere look as if we do not really stand for any solid principles, but are just trying to interfere with people smoking as much as possible. That's not what I'm in this for. I'm in this to try to save lives and reduce morbidity and suffering. And taken as a whole, I do not think Georgia's Smokefree Air Act of 2005 will do either.